Technical Pro is always one step ahead of the game with all of their products. The forward thinking engineers on their team are consistently building the most cutting edge gear on the market today. The same innovative technology and ‘built-to-last’ design was used in making the TW60T Professional Carpeted Six-Way Tweeter Tower. The TW60T tower is built with an advanced sturdy design that will work efficiently in the most harsh conditions in a club or arena or snugly in your home audio system. The protective tower holds 6 tweeters. The 6 tweeters housed in the tower design contain a piezo design. 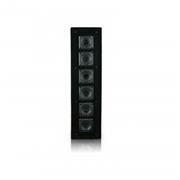 Each tweeter contains a piezoelectric crystal which when flexed produces a flawless output. If you are breaking down and setting up gear, this is the design you need! The TW60T is a professional speaker for professional audio heads! The TW60T tweeter tower is able to push out 300 watts of peak power. Audiophiles and engineers will agree that a clean, powerful throw of high frequency is a must have in any audio environment. These are the frequencies that give the song it’s shine and if your music is not properly translated, you will be stuck in the muddiness of poor acoustics. The TW60T ’s design is built to last and built to be used under extreme conditions. You will never have to worry about getting stuck in the mud again! The advanced components inside are matched outside by its professional design. 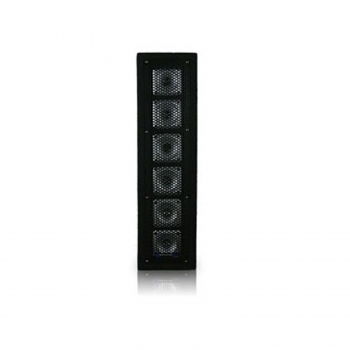 If you take one look at this speaker in a club or on stage, you will know you are in the realm of a serious audio set up! Pro Audio Pro Audio Pro Audio! This tweeter tower is ideal for the studio, live stage set up, mobile DJ rig, or anywhere else you want a professional audio set up that will never fail! The heart of the TW60T lies in its unique combination of premium construction quality along with features and performance technology previously unheard of at this price level, offering a range of options without equal. With improved performance and great looks, they deliver smooth highs at any level. The quality wood cabinetry construction is carpet-covered and has an extra heavy-duty metal grille for ruggedness.